Home | Sink Your Teeth Into Dino Days at the California Academy of Sciences! Sink Your Teeth Into Dino Days at the California Academy of Sciences! This spring, bring the kiddos to walk with the dinosaurs at the California Academy of Sciences' newest exhibit: Dino Days! On view from March 22 through May 5, 2019, Dino Days allows visitors to the Academy's East Garden to see, hear, and walk among realistic life-size dinosaur models that move and roar, as well as be a paleontologist for the day while digging for dinosaur fossils in one of two sand pits. We had a chance to check out the exbibit during their media preview this week and it's a lot of fun. The dinosaur models are really impressive and will entrance both young dino enthusiasts and their parents. During Dino Days, you can also explore a diverse collection of prehistoric specimens on display throughout the museum, including a dinosaur leg bone, Sauropod coprolite (fossilized poop! ), and touchable fossils in the Naturalist Center. Don't forget to visit the Academy's T-Rex skeleton cast at the museum entrance, too. There will also be interactive dinosaur-themed programming, like a puppet show exploring how fossils are made, daily dance-offs that teach you to move like a pterosaur, and dino-inspired crafts on select dates this spring. Come dive into story time with an ancient twist. Don’t miss this adventure with mysterious creatures from millions of years ago. Can you dance like a pterosaur? Join us for this interactive skit in which you help a scientist and a video director character create a pretend "music video" that reveals the true nature of pterosaurs. Become a dinosaur! Have your face painted as an ancient reptile and then join a costume parade around the Academy. Learn what it takes to become a fossil in this interactive puppet show for all ages! For more information on Dino Days, and a full schedule of programs, visit www.calacademy.org. The Cal Academy is open Monday through Saturday from 9:30 am to 5 pm and Sunday from 11 am to 5 pm. Tickets are $35.95 for adults; $30.95 for seniors 65+, students, and youth 12–17; $25.95 for children ages 4–11; and free for children 3 and under. You can buy your tickets online in advance. 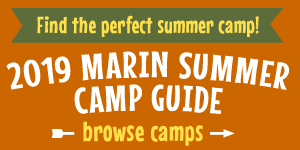 You can also check out a family pass, good for one adult and one youth, from the Marin County Free Library.